Verbier is famous for an outstanding ski area in Europe and lies high in a sheltered position in Switzerland's southern Alps. It is equally ranked alongside the likes of Val D'Isère, St. Anton, Chamonix and Zermatt for its range and variety of pistes and (lift served) off-piste skiing. There are lots of shops and boutiques in the cosmopolitan village centre, as well as popular bars and restaurants providing lively nightlife. However, the village comprises of concrete apartment blocks. Only 1,500 of 15,000 beds are in hotels. 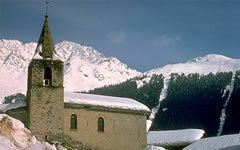 The Skiing: After a fall in popularity in the 1980s, Verbier has reinvented itself with a renovated lift system. In 1994 it introduced a giant 30-person gondola, linkng Les Ruinettes to Les Attelas, and then in 1998 an 8-person gondola at Tortin. A new gondola in 2002 from Le Chavle to Verbier and Les Ruinettes dramatically increased uphill capacity per hour and eased lift queues at the Medran lift station. The vast ski area provides high and varied skiing with over 400km of well groomed runs to choose from, with a choice of seemingly unlimited off-piste and legendary runs. The glacier provides guaranteed skiing. 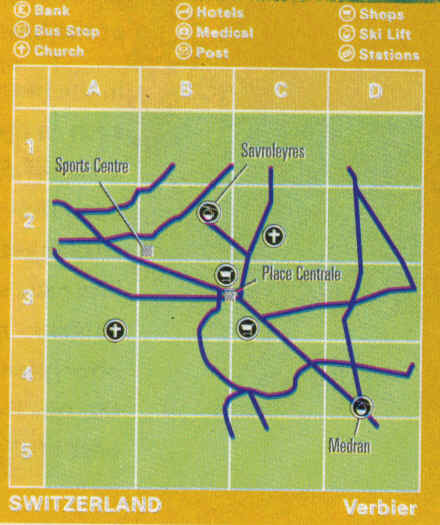 The piste map doesn't really illustrate the true potential, with many runs not shown.